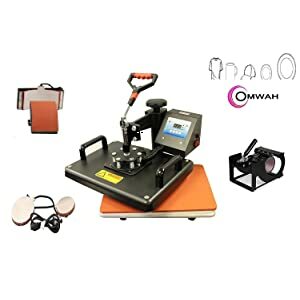 If you are looking for the best heat press machine for your small business production, Omwah 5-in-1 heat press machine is your perfect match. This device has been specially designed to make it convenient for you to transfer images and designs to countless items including caps, mugs, garments and more with just one unit. As it’s a commercial-grade model, you can use this heat press machine to work on a wide range of projects for your customers. And you’ll surely get lots of clients due to the remarkable quality outcome by the machine. The Omwah Heat Transfer Press is a premium-grade machine, capable of delivering 1250 watts output in just 110 V power supply. For optimal power input and maximum safety, it comes with a US standard grounded plug. It gives you an extensive temperature range of 0 to 399 Degrees Fahrenheit and the timer of this unit can be adjusted between 0 and 999 seconds for definite output. The heat platen of this machine requires very less time to warm up, hence doubling your work efficiency. The flat heating element of this device measures 12 by 15 inches, where you can print numerous objects with flat surfaces including t-shirts, bags, puzzles etc. As this is a combo model, it comes with four additional parts, which includes a mug press, 6 by 3 inches curved cap press, 5 inches in Diameter plate press and 6 inches in Diameter plate press. All the elements are constructed compact in order to save maximum space. The entire unit together weighs around 60 pounds, so they can be moved around easily, one at a time. Digital time and temperature settings will let your machine operate at the most precise settings for the particular item that you’re working on. 4/5 inch thick heating board. 2 4/5 inch long arm handle with soft grip for a comfortable hold and user convenience. You won’t feel any sort of fatigue even when you have to pull it repeatedly for prolonged periods. Also, two handles are attached at the sides for handy transportation. The handles are heat-insulated and user safe. Full 360-degree rotation of swing-away design will give better access to the layout area. You can clearly view the entire working area. LCD screen that comes with the machine will enable the user to virtually observe the temperature and heat settings. The readings are simple and easy to understand. 98 inches thick wide Teflon coated elements guarantee non-sticky and scorching free operation, delivering high-quality transfers. Adjustable spring tension for balanced pressure and heat distribution over the workpiece. It comes fully assembled and ready to use out of the box, which saves you a lot of time. Heavy duty construction for maximum durability in the long run. As the unit includes 5 different heat presses, it’s more versatile and beneficial than other flat heat presses. Best for small heat press business start-up with a limited budget. Delivers better quality results than clamshell flat presses with the same power. Relatively safer as you are not working directly under its heat platen. As the upper heat platen swings away 360°, it requires extra working space. It requires an experienced operator due to a steeper learning curve, so if you are a newbie or learner then this is not the right option for you. Only one press can be used at a time. Due to the swing design, it has lesser work efficiency than other clamshell models. The Omwah 5-in-1 heat press machine is the ultimate package of power, quality, versatility, and reliability. It’s one of the most popular heat press devices among small business personnel. The machine is available at a very reasonable price, and its features and elements are totally worth every penny of your investment.